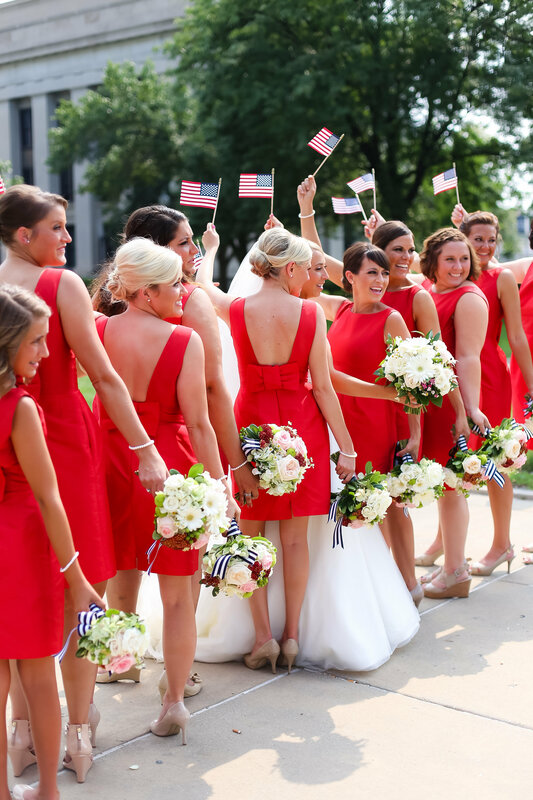 In honor of the holiday weekend, we thought it was only fitting to feature with our most patriotic wedding yet! 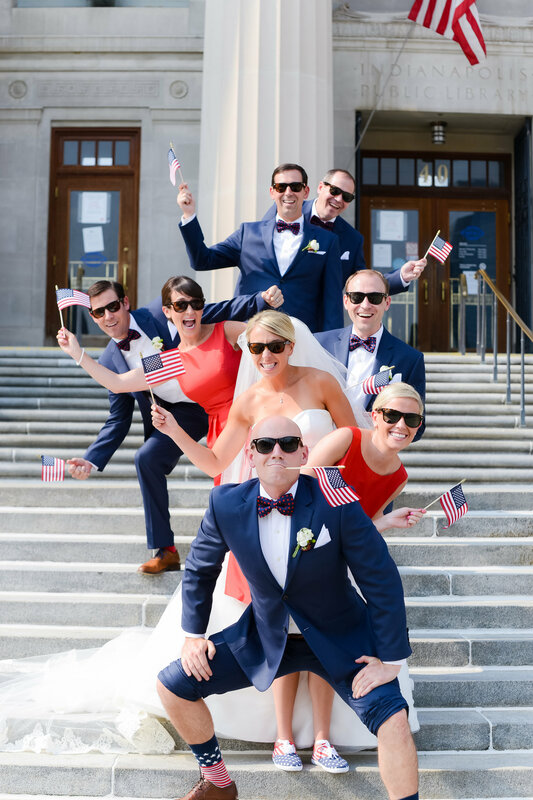 Our STUNNING bride Kelly and her handsome husband Zac went all out for their July 4th wedding in Indianapolis. 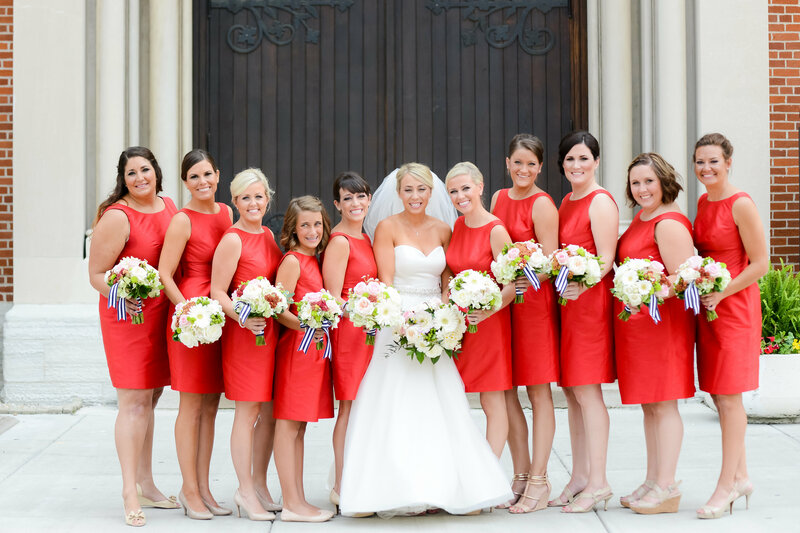 We are seeing stars and stripes forever after looking through these gorgeous photos! 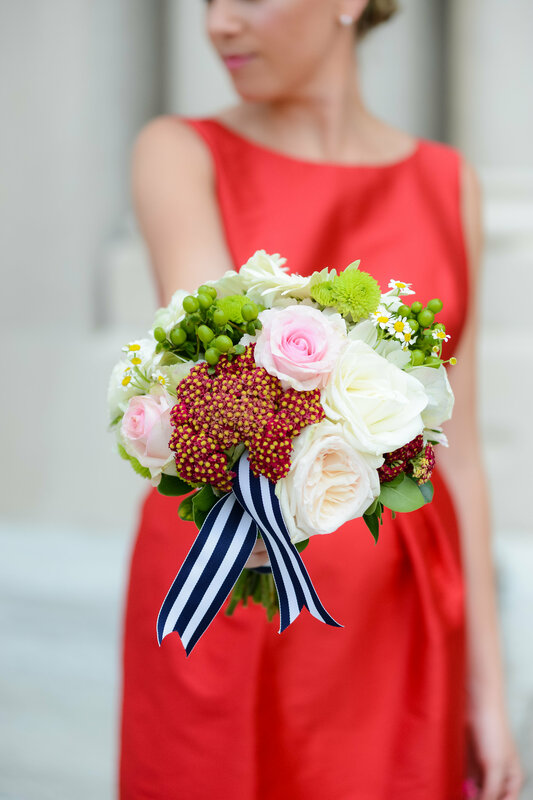 Get ready to be inspired and learn how to do a holiday wedding the right way! I actually met my husband on my interview at Ohio University. I was interviewing for an assistant coach position for softball and he was the strength and conditioning coach for softball, baseball, basketball and football so he was apart of my interview process. I obviously took the job and the rest was history! Zac had just took a new job at a facility down in Florida and we were trying to go to some of our favorite local places before the move. He was getting somewhat dressed up for dinner which was a little uncharacteristic...then the shirt he wanted to wear was dirty so he got mad which was weird too!! We went out to dinner and saw another coach who wanted to have a drink before our move so after we ate we went upstairs to chat. I could tell he was starting to get a little antsy and finally wrapped it up. He said he wanted to catch the sunset at a lake/park near by. He was driving super fast and parked at a spot I had never been to. He said we were gonna go on a walk. On the walk he managed to run into multiple branches and get pricked by some thorns. Then we walked through some more vegetation where he had a picnic table set up with the ring and some champagne. He got down on one knee while his friend was hiding in the trees in camo and let out his dog to be apart of the proposal. He also had a photographer hiding in the woods but because of our drink at the restaurant we missed the sunset and he didn't bring a flash! He was funny because now I knew why he was so antsy to leave because of his plans! Our choices were minimal because my family is so large. I am one of eight kids and my mom is the oldest of 14. My family alone is close to 150 people so the thought of a small wedding was not in the works. We also both like historical architecture and old school craftsmanship and wood working. 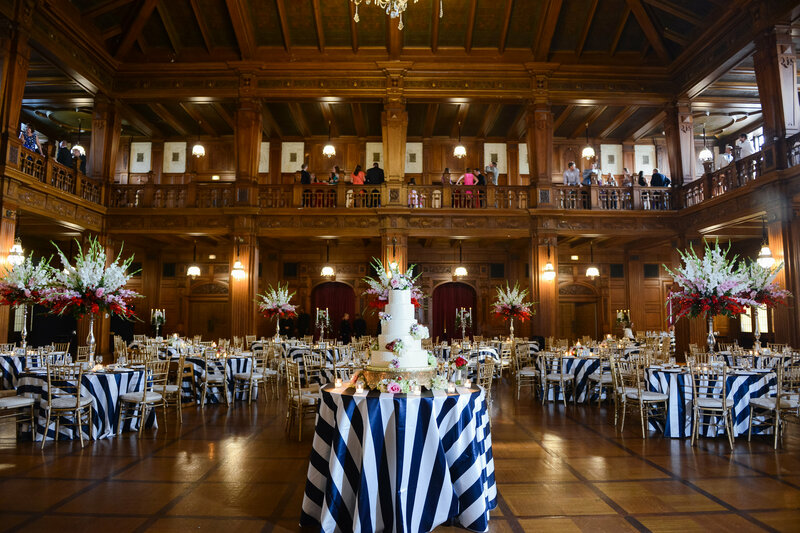 The Scottish Rite Cathedral had all of this and was an easy choice! We needed somewhere that could accommodate our family and allow us to dance and have a great time! My sisters actually had a lot to do with the dress choice. I was up for anything but after deciding on July 4th as our date I knew we had to go with a red, white and blue theme. I just wanted to make sure everyone was comfortable and could possibly wear it in the future. Tell us about your experience at Bella Bridesmaids! We loved our experience at Bella. Kathleen, the Indianapolis owner, is actually a family friend and is married to one of my brothers best friends! She is always accommodating and the whole staff is so friendly! We were unsure a couple times on the dresses and since I lived out of town my sisters would go in and send me pictures of the dresses and color swatches. The process was also easy for my out of town bridesmaids and the dresses were shipped to them to make the process even easier! I am not a big designer person so I actually have no idea. I just wanted a "traditional" dress with at least a little satin. Growing up and being apart of many of my aunts weddings in the early 90's I always thought satin should be apart of the dress. 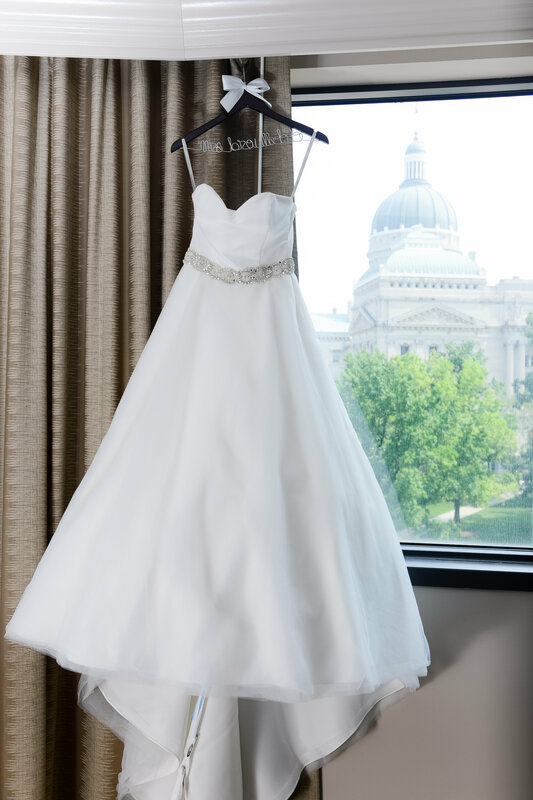 So the top of the dress was satin and the bottom was soft tulle. Where did you get it? 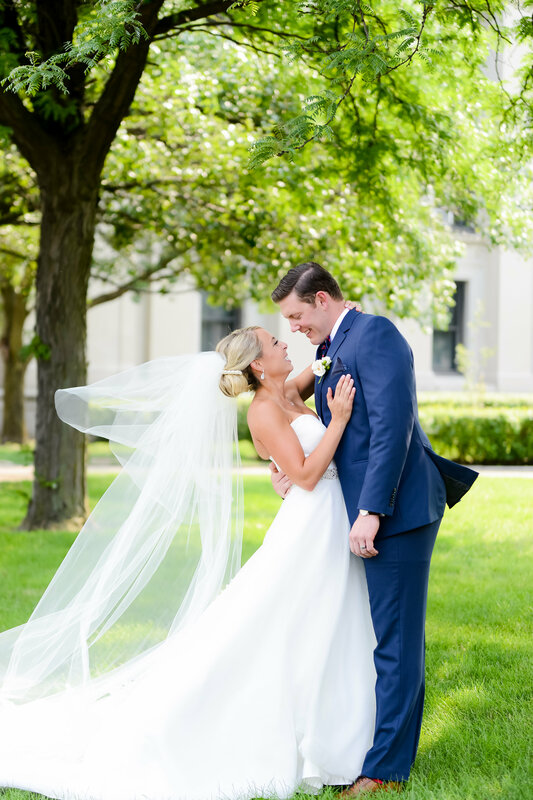 Blue House Bridal in Carmel, IN who was also amazing to work with. The owner Brittany was a pleasure to work with and actually listened to what I wanted and liked. Many places we went to just put me in dresses that were popular right now or what looked good on my body. So it was comforting knowing that she was actually listening! I don't know if I could name just one, the whole day was absolutely amazing! From getting ready with my best friends and family, to huddling up and doing a pre-wedding cheer, to saying our vows, to the reception and fireworks...it was just all so amazing!! 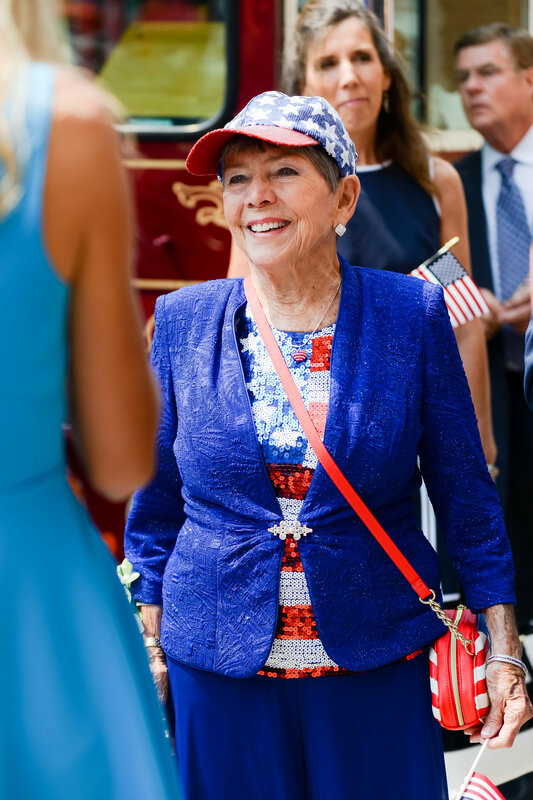 I am not the most fashionable of sorts but we really wanted to go with the patriotic theme! 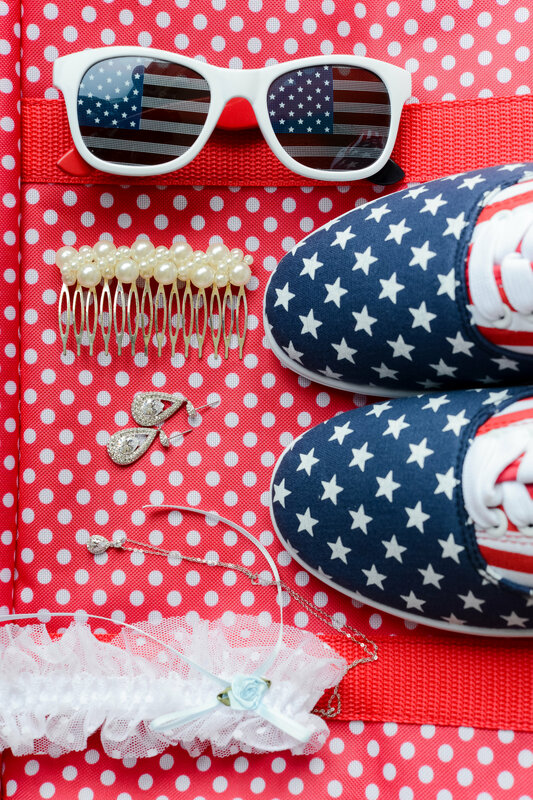 It's not very often the forth of July falls on a Saturday, so we really wanted to go with it. We both love America and actually have an American themed room in or new house. I just think red, white, and blue are so classy and it would be hard to go wrong with that theme! Trust your instincts, have fun and just relax. The day goes by way too quick and while it's important to plan don't get so caught up in the details. In the end, everything will work out and if something goes wrong it was meant to be. Some of the funniest memories of the day were from mistakes, so have fun and enjoy marrying the man of your dreams! Thanks to Kelly and Zac for letting us be apart of their special day! We know their future is filled with lots more fireworks!